A couple of weeks ago I visited a nursing home in Petaling Jaya to check out the place. This is a voluntary service I provide for the seniors community. I make it a point to find out as much as I can about a home or daycare centre before I recommend it to anyone who writes to Seniorsaloud to inquire on behalf of a family member. The temporary banner at the gate will have to do till a proper signage is put up. So there I was, on a Monday afternoon at the gate of White Dove Retirement Nursing Home along busy Jalan Penchala, PJ. I had called earlier to make an appointment. The timing was great as Dr Ivan Bernard was there as well to check on the residents. He and his wife Sheela set up the two White Dove homes when they realized there was a growing number of elderly people in need of good nursing care. The pictures below will give you an idea of the facilities at White Dove. (Above) There are two White Dove homes - at No. 75 and No. 95, Jalan Penchala. This is the exterior of No 75. The residents were enjoying some activities when I visited. A good nursing home should have a daily schedule of activities for those who are able to participate. This should include physical and mental activities that exercise the body and stimulate the mind. The little garden outside with benches along the wall. Look for homes that have plenty of greenery, and areas where the residents can relax, and take in some fresh air and sunshine. The tea room and living room. Plenty of space to move around in. But I would definitely remove the carpet. The floor should be clear of any objects that might cause an elderly person to trip and fall. A view of one of the dormitories. No rugs here to cause falls. Clean, bright and airy, with basic furniture. The elderly have few personal belongings, so a simple stack of drawers should suffice. The screen offers some privacy when needed. After a quick tour of the premises with Dr Bernard and Sheela, I was invited to drop by at the second home just up the road. No. 95 caters to retired professionals who are still active and independent, and who prefer quiet surroundings. Obviously the charges are higher for more exclusive facilities. The entrance to No. 95. A sizable bungalow converted into a retirement home for independent retirees who require minimal or no nursing care. The cosy living room is like any you would find in a typical upper middle-class house. The well-lit corridor leading off to rooms on both sides. Flowers everywhere in paintings, in vases and in every room. A typical single room. If this were to be my room. I would want a cupboard for all my books, a bedside reading lamp, a bigger chest of drawers for my clothes and a writing table. As far as I know, no retirement home offers personalized single rooms. I am sure residents wouldn't mind paying a little extra for additional comforts. A 3-bed room tastefully done up for those who prefer company and lower rates. The dining room with the kitchen in the background. I don't see the need for the grill door separating the two rooms, unless there is a safety reason for it. Sheela and her husband Dr Bernard. Friendly and caring - the qualities all nursing care professionals must have besides the relevant paper qualifications and experience. This wall panel caught my attention as I was about to wrap up my visit. "LOVE, PEACE, HOPE" - Well chosen words that bring comfort to the elderly. The challenge is for White Dove Homes to continue providing all three to those in their care. 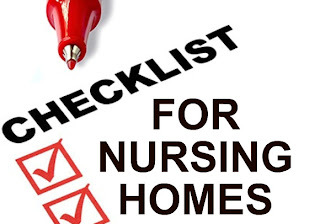 There are other things to bear in mind when deciding on a nursing home. Is the support staff suitably qualified and trained? What is the staff to resident/client ratio? Are there regular visits from doctors? Are there provisions for hospital/clinic visits? What about social activities and outings? Check out the menu as well. Ask the right questions to get a clear picture of the services and facilities provided before you decide if this is where you want your loved one to spend the rest of his days. For more information about White Dove Homes, you can contact Sheila at 016-3915819 / 012-9234389, or call the home at 03-77822413. The address is White Dove Retirement Nursing Home, No.75, Jalan Penchala, 46050 Petaling Jaya, Selangor Darul Ehsan, Malaysia. For a complete checklist of what to look for in a nursing home, please click on Full Circle of Care. I do agree with you about the living room in home No.75 that it would be prefer to removed the carpet on it to avoid the elderly from slipped and fall. But as a whole, it really good to have this kind of nursing home care. And it is really important to know the typical questions prior deciding for the benefits of our loved ones.